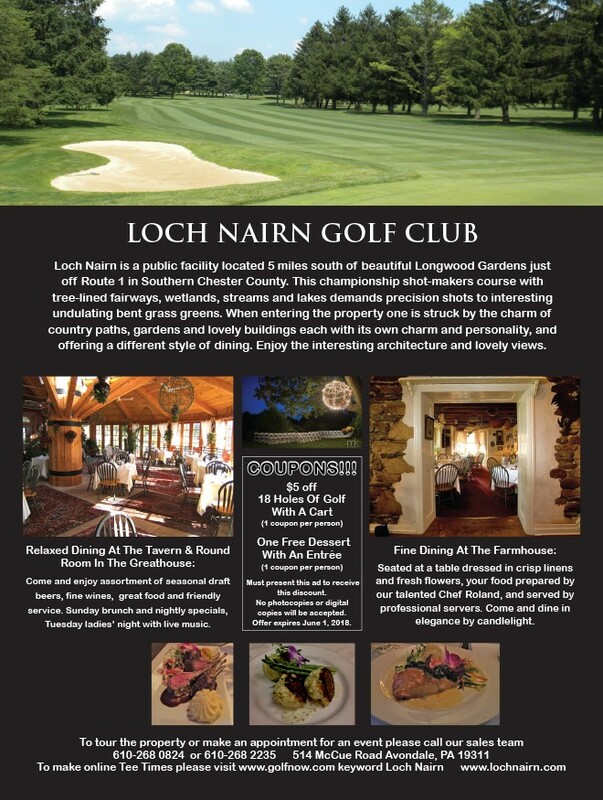 Loch Nairn is a public facility located 5 miles south of beautiful Longwood Gardens just off Route 1 in Southern Chester County. This championship shot-makers course with tree-lined fairways, wetlands, streams and lakes demands precision shots to interesting undulating bent grass greens. When entering the property one is struck by the charm of country paths, gardens and lovely buildings each with its own charm and personality, and offering a different style of dining. Enjoy the interesting architecture and lovely views. Come and enjoy assortment of seasonal draft beers, fine wines, great food and friendly service. Sunday brunch and nightly specials, Tuesday ladies’ night with live music. Seated at a table dressed in crisp linens and fresh flowers, your food prepared by our talented Chef Roland, and served by professional servers. Come and dine in elegance by candlelight. Must present this ad to receive this discount. No photocopies or digital copies will be accepted.